…West London, both combing the market for good second-hand traditional British men’s clothing. A business partnership is soon started with their own small stall in Portobello, selling on the clothing after cleaning and repairs. Today, Hackett’s new collections are available globally and are celebrated for their re-interpretation of British style for today’s gentleman as well as their quality. From bespoke tailoring to iconic sports garments, Hackett’s fineries are as at home at Sandringham, as they are at Silverstone. 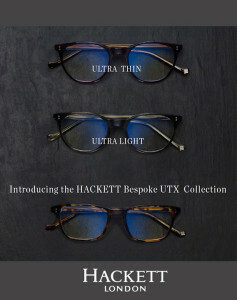 Half the thickness of a regular frame, Hackett Bespoke UTX (ultra thin xyl) are 30% lighter than normal, which means a more comfortable fit. Deeper silhouettes are designed for progressive lenses. Ultra Thin. Ultra Light. Classic, but never old fashioned. Handmade acetates in rich coloring, real riveted hinges with metal end pieces reflect the re-interpretation of British style that is Hackett London. Contact your Mondottica USA sales representative or visit mondotticausa.com to preview the collection. Mondottica is respected within the eyewear industry for their unwavering dedication to providing the highest quality of products. Their staff works closely with trusted suppliers to uphold their product specifications, costs and delivery schedules, while maintaining superior quality control. Mondottica USA was formed in January 2010. With over 80 years of combined optical industry experience, Harvey Ross, Mitchell Barkley and Gary Podhaizer have reunited to distribute eyewear products under an exclusive agreement with Mondottica International. Arguably one the most successful eyewear companies to appear on the world stage in the past decade, Mondottica International is a true world citizen and we are proud to extend distribution of their collections to the United States.